Great Rates, located between Seaside and Watercolor! Property Size 2,174 sq. ft. This 2014 Brand New Home will be perfect for your family vacation in the 30A area! It’s 3 bed/3.5 baths + bunk, loft and 1 car garage. The owners visit often and take meticulous care of their properties! The home has 1st floor Master suite with king bed and private bathroom. Upstairs you will find two Guest Bedrooms with a Queen bed and attached private bathroom. The loft is upstairs as well featuring a twin bunk bed and queen sleeper sofa. Bright kitchen features white shaker cabinets, granite countertop, Built in GE Café appliance package w/gas cooktop and chimney style hood, subway tile backsplash and under cabinet lighting. Gorgeous homesite facing pond and preserve- perfect place to relax after a day on the beach. Across a welcoming wooden bridge, nestled amongst preserves, winding trails, and boardwalks, you will discover NatureWalk at Seagrove. 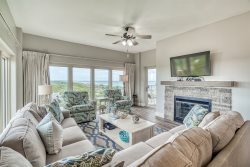 This ultimate walkabout community has a prime location near the famed 30A in addition to providing residents with the amenity-rich Gathering Place and direct access to Point Washington State Forest. Here, our residents love the endless year-round activities that NatureWalk provides them. A short stroll away are the artsy villages of Seaside, Seagrove and Watercolor which are full of funky beach bars, and world-class restaurants with everything that you could possible want or need. With the perfect balance of a prime, walkabout location, breathtaking views, and endless activities, NatureWalk at Seagrove truly is the ultimate beach community. Add housekeeping and 11% for tax. There is a $69 damage waiver; $30 booking fee, 2.5% to process credit card payments. 25% down payment is due at booking and the remaining balance is due 30 days prior to your arrival.